Dr Heaney works in many clinical settings. His NHS practice is based at Queen Square and UCLH NHS Foundation Hospital Trust. 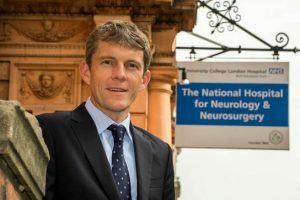 He manages in-patients at the National Hospital for Neurology and Neurosurgery (NHNN) and is one of a small team of ‘liaison’ consultants who provide advice and ward-review for inpatients at the variety of hospitals of UCLH, including the trauma wards, ITU and obstetric units. Most of his NHS outpatient work takes place at NHNN and his regular clinics there are on Tuesday, Wednesday and Friday, where he sees up to 50 patients per week. He sees patients privately at the Queen Square Private Consulting Rooms (QS PCR). His regular private clinic takes place on a Thursday morning, but ad hoc appointments may be possible and your requirements should be discussed with the PCR secretary. Assessment of individuals in relation to medico-legal and other expert report work is generally undertaken at QS PCR. Domiciliary visits can be undertaken but these are not routine and again, requirements should be discussed with the PCR secretary.